As part of our Work With What You Have Project and in celebration of the recent launch of our magazine (read here) we're excited to share a how-to from our Harvest Edition courtesy of Adriana Moreno of Moonshadow Goods. Adriana's gorgeous quilts, naturally dyed linens, and repurposed vintage finds are proof positive that we can work with what we have to craft something that's both beautiful and lasting. Adriana's innovative melding of vintage materials with handmade textiles doesn't just serve the scrapbook aesthetics of Moonshadow; it's respectful of the earth and by extension, us. "I try not to throw things out," Adriana says. "If there is a hole in my jeans, I'll patch it up. And if it gets another hole, I'll patch that one up too," she laughs. By transforming preexisting materials into an object that is designed to last, Adriana's production process is a pointed challenge to our throwaway culture. Part of exercising compassion to our environment is recognizing that we've already been given so much. Working with what we have can be as rejuvenating as it is resourceful—and that’s something we can all do in the here and now. So next time you're cooking (we recommend our Immunity Soup!) save the onion skins. 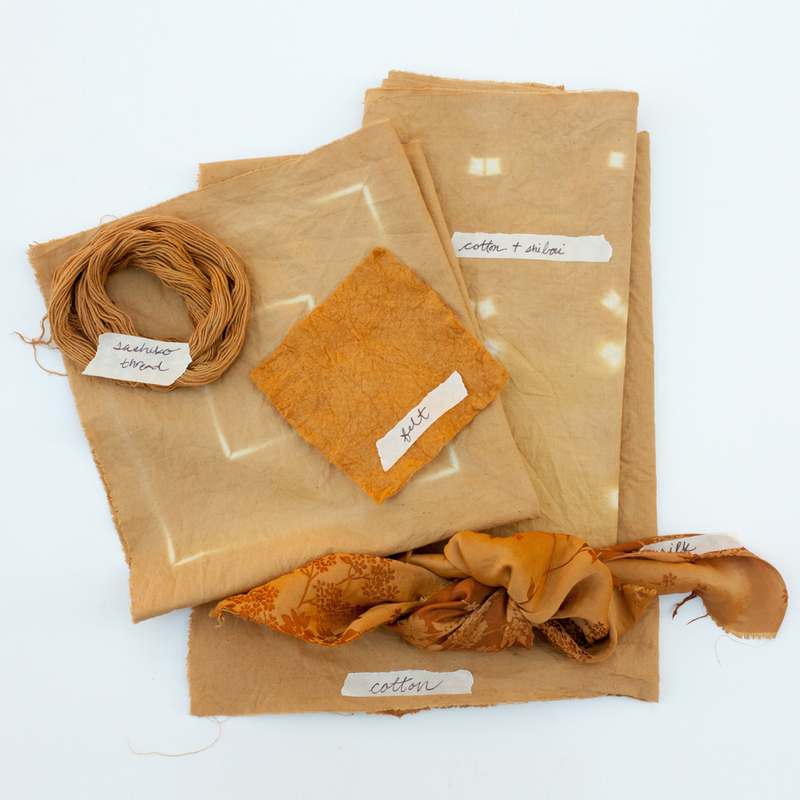 Adriana’s recipe for an onion skin dye, below, will help you give scraps that would otherwise be discarded a new purpose. Natural fabric or fibers (i.e.. cotton, silk, wool, felt, wool yarn). Large pot. Stainless steel is preferred. I would recommend a pot that you don’t use for cooking food. Heat source (i.e., stove, hot plate, propane stove). (1) Fill your pot with the onion skins, then add enough water to submerge the skins. Leave some room for your fabric. (2) Boil the skins uncovered for 1 hour. Stir a few times throughout the hour. (3) I like to let the onion skins soak/steep over night. This step is not necessary but allows for a more concentrated dye bath. (4) Optional step: Make fun patterns by folding, wrapping and tying fabrics in different ways. 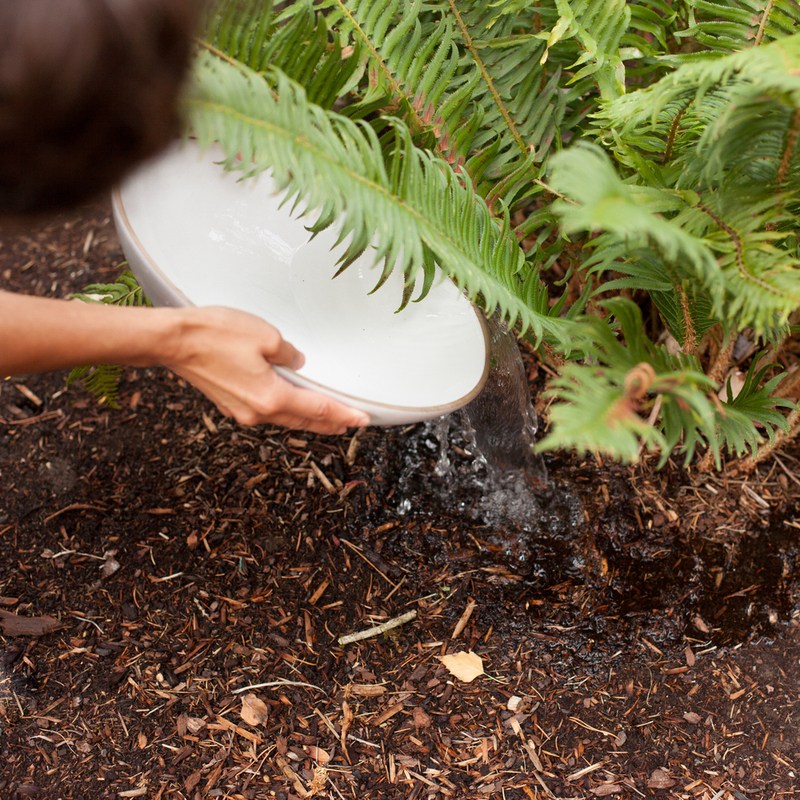 (5) Next, soak your natural fabric in clean warm water for at least 45 minutes. (I like to soak my fibers for about 2 hours.) Soaking your fabric will allow the fibers to open up and dye evenly. (6) Strain the onion skins from the bath. (7) Add your pre wet fabric to the bath. With the fabric in the bath, bring it back to a boil for 1 hour. Keep an eye on the bath and make sure to release any air bubbles from within the fabric. (8) Once again, let the fabric soak/steep in the dye bath over night. Letting the fabric soak in the dye bath over night will yield more saturated colors. (9) The next day, remove your fabric from the dye bath and rinse with cold water until the water runs clean. Three to four rinses should do. 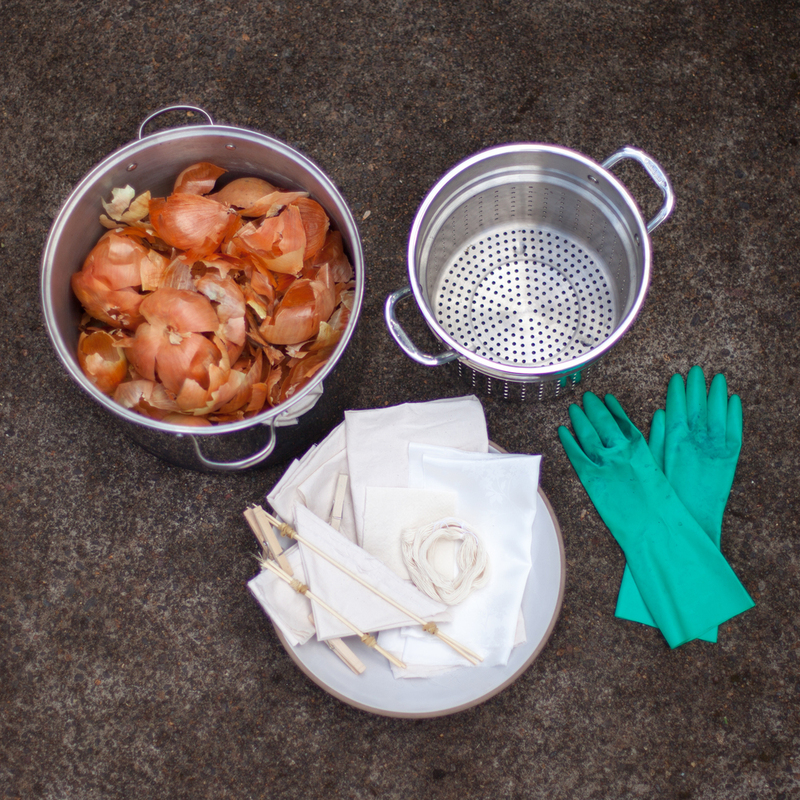 (10) Your used onion skins can be put into a compost or mixed into soil. 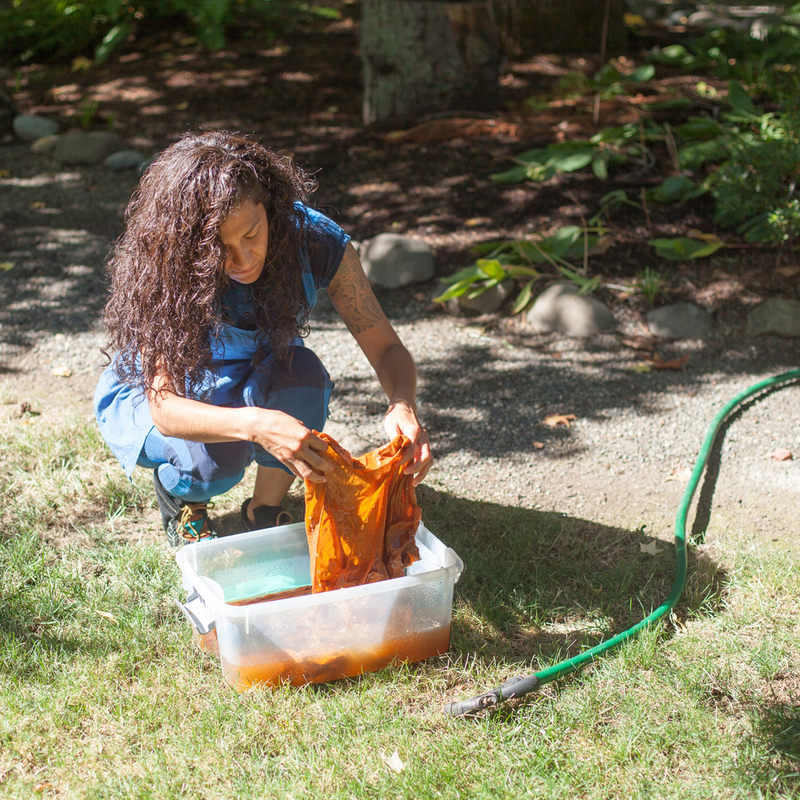 I’ll also use the dye bath and rinsing water to feed outdoor plants, ensuring nothing goes to waste. Then hang your newly dyed fabric to dry and voila!